Five home games and a season-opening road trip to Southeastern Conference foe, Vanderbilt, highlight Western Carolina's 11-game 2009 Catamount football schedule. The slate includes three teams which made the NCAA Football Championship Subdivision (FCS) playoffs a season ago and a Football Bowl Subdivision (FBS) winner. "The 2009 schedule is very exciting," said second-year head coach Dennis Wagner. "Our team and staff are looking forward to the challenge." Western opens the season with a road trip to SEC-opponent, Vanderbilt. Under the direction of former Furman head coach, Bobby Johnson, the Commodores are coming off a 7-6 season in which they opened with five-straight wins, moved into the national Top 25 and won the Gaylord Hotels Music City Bowl over Boston College. WCU will host the Runnin' Bulldogs from Gardner-Webb for its home opener on Sat., Sept. 12 in Cullowhee. It is the fifth meeting all-time between the two schools in a series that dates back to 1932. A week later, the Catamounts jump into Southern Conference play by visiting Georgia Southern in Statesboro, Ga., on Sept. 19. The opening month of the season will wrap-up by hosting Furman on Mountain Heritage Day, Sept. 26 in Cullowhee. The October slate opens with Western's first-ever trip to Samford as conference opponents. The Bulldogs joined the SoCon last season, finishing tied for fourth at 4-4 overall. After an open date on Oct. 10, the Catamounts host back-to-back home games against The Citadel and Wofford on Oct. 17 and 24 in the annual Homecoming and Family Weekends. October closes with a road trip to Chattanooga to face the Mocs and first-year head coach Russ Huesman. November's schedule is headlined by the final home game of the regular season as the Catamounts host Elon on Nov. 7. WCU will also induct its 20th class into its Athletics Hall of Fame that weekend. The Catamounts will close 2009 with consecutive road games as they visit Eastern Kentucky in Richmond, Ky., and wrap-up the regular season with the annual "Battle for the Old Mountain Jug" against arch-rival Appalachian State in Boone on Nov. 21. 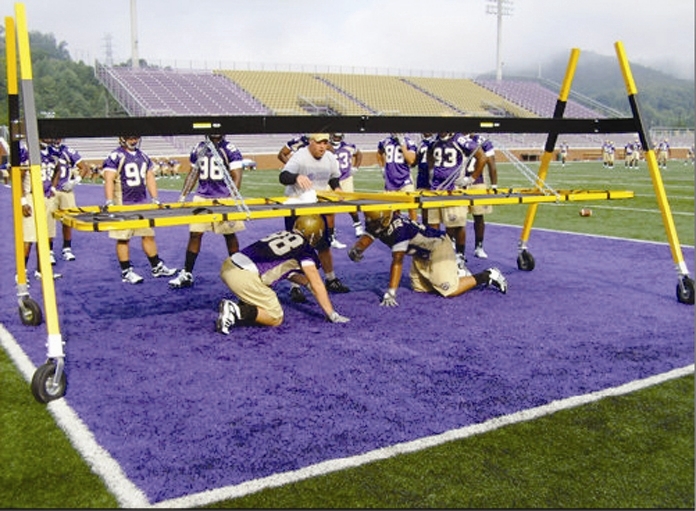 Five Western Carolina Catamount football games will be broadcast across a combined three stations this fall, beginning with the season-opener and culminating with the Family Weekend home date with Wofford. Comcast/Charter Sports Southeast (CSS) will carry the 2009 season-opener as the Catamounts make their first-ever visit to Nashville to face the Vanderbilt Commodores on Saturday, Sept. 5. (Check local listings for availability). The game is scheduled for a 6:30 pm CT kickoff, 7:30 pm on the East Coast. SportSouth will carry the Catamounts' conference opener on the road at Georgia Southern in the first "SoCon Saturday" game of the season. Kickoff is set for 7:00 pm on Saturday, Sept. 19 from Paulson Stadium in Statesboro, Ga.
Three WCU home games are set for broadcast by the Asheville-based station My40 Sports, WMYA. The trio of home dates will begin with the Mountain Heritage Day battle with Furman at 6:00 pm Saturday, Sept. 26, followed by the Homecoming showdown pitting Western Carolina against the Citadel at 4:00 pm Saturday, Oct. 17. Also on the WMYA fall programming schedule is the Catamounts' Saturday, Oct. 24, contest against Wofford, when the Pride of the Mountains Marching Band will receive the Sudler Trophy, the Heisman Trophy of collegiate marching bands. Kickoff is again set for 4:00 pm. WMYA and sister-station, WLOS, carried two Catamount football games a season ago, and also partnered with Western to broadcast three men's basketball games as well, including the opening round of the Great Alaska Shootout. My40, WMYA is scheduled to broadcast six games involving WCU, Furman, The Citadel, Presbyterian, Wofford and Appalachian State including an inter-conference match-up of highly ranked teams when ASU plays host to McNeese State. The station will also debut a 10-week schedule of high school football games called "Thursday Night Lights" on August 27, with all of the high school games and all but one of the college contests on My40.